In addition to being pursued by the SEC, TelexFree net-winner Faith Sloan also faced clawback litigation from the Trustee. According to the Trustee, Sloan stole $710,319 from TelexFree victims. Earlier this month we reported Sloan had reached a settlement with the SEC. Daily Freedom Challenge provides no information on its website about who owns or runs the business. The Daily Freedom Challenge website domain (“dailyfreedomchallenge.com”) was privately registered on January 5th, 2019. I did come across multiple affiliate promoters citing Clifford Gholston as Daily Freedom Challenge’s owner. This lead me to Daily Freedom Challenge’s official Facebook group, which was created by Gholston (right) in November, 2018. Schemes Gholston has previously promoted include CryptoBitX (bitcoin gifting), Appi Travels (bitcoin gifting), CryptoGenX (bitcoin gifting), Karatbars International (pyramid scheme), VidCommX, Penny Matrix (pyramid scheme) and AdExperts (cycler Ponzi). Gholston runs Daily Freedom Challenge out of of Missouri in the US. ABC Systems provides no information about who owns or runs the business on their website. The ABC Systems website domain (“theabcsystems.com”) was privately registered on February 15th, 2019. Further research reveals Doniel Tiggs, a prominent ABC Systems promoter, claiming the company is headquartered in Hong Kong and headed up by CEO Joseph Che-Woo. In the US there is also an ABC Systems Fort Lauderdale Training Center in Florida. No information about Joseph Che-Woo is provided. The only mention of Che-Woo in relation to ABC Systems is on Tiggs’ marketing website. Prior to ABC Systems, Tiggs was promoting the OnPassive/GoFounders pyramid scheme. Further back we’ve got Coinsinos, Crypto World Evolution, USI-Tech, World Global Network and Skinny Body Care. Visitors to ABC Systems’ website are presented with information about Todd Disner and Felix “Phil” Piccolo. Disner is credited as ABC Systems’ first Seven Star ABC Director. Tiggs also states he’s ‘the most honest, sincere, trustworthy and humble man you will ever meet‘. The two companies Disner (right) associates himself within the MLM industry are Ad Surf Daily and Zeek Rewards. Todd’s 1st exposure to MLM was a company called Ad Surf Daily. Todd joined through a friend and could not believe the success of this new advertising system that people were buying $10,000; $25,000 and $50,000 advertising packages even though people could get started for as little as a hundred dollars. The success was so fast and so big the government came in and confiscated everything. Computers, money and the owners were 70 years old. Nobody understood the model in fact if you really think about it. Todd to this day believes Ad Surf Daily was just ahead of its time. The reason the “government came in and confiscated everything”, is because AdSurfDaily was a Ponzi scheme. Andy Bowdoin, owner of AdSurfDaily, was arrested in December 2010. He was charged and indicted on two counts of wire and securities fraud. The DOJ alleged AdSurfDaily was a Ponzi scheme. Bowdoin plead guilty to the charges and was sentenced to 78 months in prison in August, 2012. Despite Disner’s “ahead of its time” claim, Ponzi schemes like AdSurfDaily have been around since the 1800s. Years later a friend of Todd Disner tells him about an internet bidding company ZEEK REWARDS. Same issue Todd buys a few hundred dollars of bids and shares the program with a few friends. He did two conference calls a week and never hyped anything and showed a very simple non hype simple presentation of how he started with just a few hundred dollars and proved to so many that the system was working, and people were being paid. Todd only sponsored a few people mostly friends. He may have personally sponsored as many as a dozen or so people in total. However, the dozen or so people turned into over a million people on his team who purchased packages for as little as $100 all the way to the maximum of $10,000. He could not believe the success of this company located in a small town with people lining up around the Zeek Rewards office building that use to be a car dealership. People were sending in and bringing in millions of dollars. The local banks were upset because people were breaking their CDs and emptying their savings accounts and bringing their money to this old car dealership building that had over 50 people taking in money and processing orders. Once again without notice the government came in took all the computers and seized the money (hundreds of millions) of dollars. Once again, the owner Paul Burke was 70 and his wife had cancer and to this day does not know what he did wrong and why this was all happening. Years later there is no evidence that Zeek Rewards was running a PONZI but just an incredible success story that was stopped in its tracks without notice. Zeek Rewards is one of the most notorious MLM Ponzi schemes of all time. The SEC shut down Zeek Rewards in August, 2012. Regulatory investigations into Zeek Rewards revealed it was an $850 million dollar Ponzi scheme, and on the verge of collapse when it was shut down. A far cry from Tiggs’ take that “Zeek was an incredible success story”. Zeek Rewards’ owner, Paul Burks, was indicted on four counts of fraud in October 2014. Burks argued his innocence and took the case to trial. A jury found him guilty on all four counts in July 2016. In February 2017, Burks was sentenced to 14 years in prison. Contrary to Tiggs’ assertion, Burks knows exactly why he was sent to prison. At this point you might be asking yourself why Disner (through Tiggs) is adamant AdSurfDaily and Zeek Rewards were legitimate businesses. It’s because he was a top net-winner in both of them. Disner escaped relatively unscathed financially in the AdSurfDaily bust. When regulators went after Zeek Rewards however, Disner was named an insider and accused of stealing $1.8 million. Despite having the opportunity to defend himself, Disner opted not too. Subsequently, default judgment in the amount of $2.07 million was entered against Disner in July 2014. He was unaware that the time within which he had to reply had arrived, as he had not received any responsive pleadings from his co-defendants. Disner’s appeal was denied in December 2014. Final Judgment was granted in 2016. Having to return what he stole from Zeek victims plus interest obviously left Disner feeling bitter, hence the Ponzi denials. Felix Piccolo (right) is better known by his alias Phil Piccolo. He’s another Zeek Rewards net-winner who stole over a million dollars from Zeek Rewards victims. Seeing as Disner and Piccolo are both based in Florida, I’m going to go out on a limb and suggest they’re actually running ABC Systems. The Hong Kong link is probably a shell company for money laundering purposes. Joseph Che-Woo, if he even exists, is likely just some frontman stooge Disner and Piccolo dug up. Following an entry of default recorded against Matt Lloyd McPhee on February 1st, McPhee filed to have it set aside. Cents For Freedom provides no information on its website about who owns or runs the business. The Cents For Freedom website domain (“centsforfreedom.com”) was privately registered on February 21st, 2019. Two possible locations Cents For Freedom is being run from are Russia and Pakistan. Alexa currently pegs Russia as the top source of traffic to the Cents For Freedom website (19%). Note that neither of these are conclusive. The use of Karachi local time however is a strong indicator of where the Cents For Freedom admin might be based. iBuumerang prelaunched as Countdown4Freedom last month. In our prelaunch review, we ascertained Countdown4Freedom operates in the MLM travel niche. The company was headed up by Holton Buggs (marketing) and David Manning (travel). Nothing in this regard has changed with iBuumerang’s official launch. Holton Buggs (right) is cited as iBuumerang’s Chairman and CEO. David Manning is cited as CEO and President of Xstream Travel, iBuumerang’s travel services provider. Holton Buggs is best known across the MLM industry as Organo Gold’s Chief Visionary Officer. Sometime over the past month Organo Gold has scrubbed Buggs from their corporate leadership page. As far as I’m aware, neither Organo Gold or Buggs has issued a public statement regarding his apparent departure. Late last year it emerged that Buggs was promoting the IQ Chain Ponzi scheme. Officially Buggs was credited as a “strategic advisor”, but it was pretty clear he’d taken over all marketing for the company (specifics were never publicly disclosed). In December IQ Chain collapsed and was rebranded as IQ Legacy. Alexa ranking for the IQ Legacy website show a complete collapse from late January. Buggs seems to have taken whatever he was paid and quietly left the company. Again, the specifics of Buggs’ relationship with IQ Chain and IQ Legacy were never publicly disclosed. If you’re a OneCoin victim in Poland, you might be able to recover your losses via criminal proceedings. Cloud Token’s website provides no information about who owns or runs the company. The Cloud Token website domain (“cloudtokenwallet.com”) was privately registered on January 27th, 2019. Marketing videos on the Cloud Token website are presented in Chinese. The videos themselves feature a man speaking Chinese. 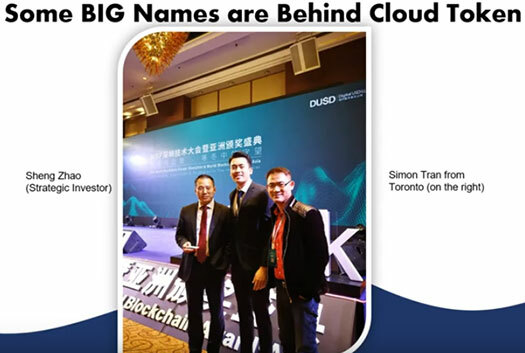 In one marketing video, Sheng Zhao and Simon Tran are presented as “big names behind Cloud Token”. Just a note on the photo itself, it was taken at a World BlockChain Forum event. 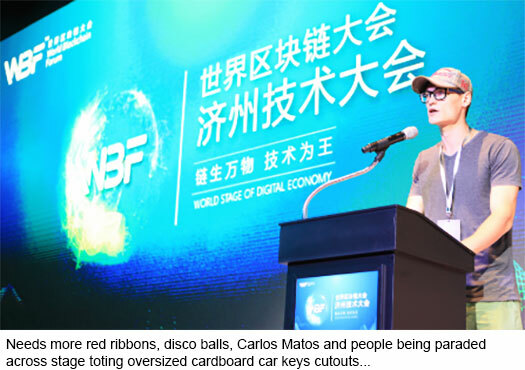 Sheng Zhao (aka Zhao Sheng) is one of the World Blockchain Forum’s co-founders. 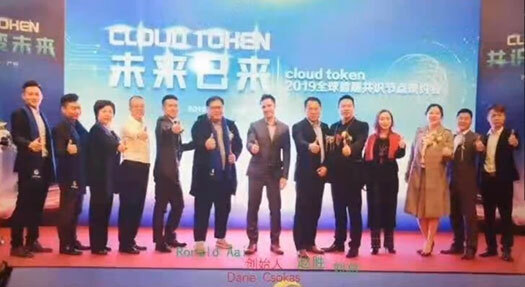 In another marketing video, the following image is presented as Cloud Token’s “prelaunch in China”. The event was purportedly held in China a few weeks ago. Ronald Aai (right) is based out of Singapore and is one of those random people you see listed in crypto whitepapers. Officially Aai credits himself as a cryptocurrency consultant, specializing in platform design. As far as I can tell, none of the crypto projects Aai has associated himself with have gone anywhere. Daniel Csokas (right) is also based out of Singapore and appears to be an MLM crypto freshman. On his personal Twitter profile, Csokas cites himself as an “organic chemist based in Singapore”. Sheng Zhao appears to be attached to the Plus Token Ponzi scheme through World Blockchain Forum. Plus Token was promoted to attendees of a World Blockchain Forum event held last September. In the marketing video the first screenshot above was taken from, Tran (right) is credited with “bringing Cloud Token to North America”. Tran himself is based out of Toronto, Canada. Prior to Cloud Token Tran was promoting Plus Token. Before he got into cryptocurrency scamming (mid to late 2018), Tran was promoting Enagic’s Kagen water filters. The RB Global Crypto Bank fallout continues, with a former admin now spilling the beans on Laurie Suarez’s fraud. Daryl Grigg was high enough in RB Global Crypto Bank to feature on the company’s “about us” page.